The Vancouver Media Co-op has received a leaked copy of the Canadian Boreal Forest Agreement, which was announced yesterday in Toronto. Click here to download the 39 page agreement, which is marked "confidential." Note that the attachment does not include "schedules" including maps. We'll post it as soon as it becomes available. UPDATE: Click here to download the full text of the agreement, including the Schedules. I'm pretty sure anyone who asks one of the NGOs can get a copy of this. Would be easier to read and have the details this one doesn't. This version was probably 'confidential' because it's from before it was announced. Greenpeace was asked for a copy the day of the press conference, they declined. I have updated with what they have since released, still does not include provincial maps. these people deserve to be further exposed and shunned by engaged and informed environmentalists, climate justice, and indigenous rights activists. Forest Ethics - I've long given up on. 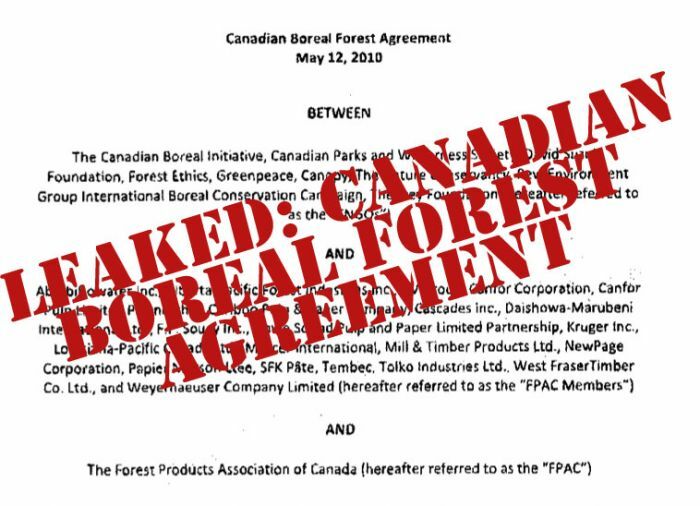 This secret deal displays a disturbing lack of respect for indigenous rights. These environmental groups have become elitist and corporate in their behaviour by not following respectful protocol when addressing land use issues on public lands. What we need now is for First Nations to be adequately funded and empowered to address industrial forest activity, as well as oil and gas activity in traditional territories in the boreal forest. After all, these First Nations and other residents are the ones that will be affected most by land use decisions. We cannot leave this up to various governments, as most have horrendous environmental and social justice records.